Complement the individual country profiles contained in the USAID Advancing Partners and Communities Project’s Community Health Systems Catalog, documentation in the Maternal and Child Health Integrated Program’s Developing and Strengthening Community Health Worker Programs at Scale: A Reference Guide and Case Studies for Program Managers and Policymakers, and other literature concerning the successes and challenges faced by large-scale CHW programs. Provide a cross-sectional reference point for the status of national CHW programs as reflected in policy and related documents. Highlight promising practices and gaps in policy and strategy when reviewed in light of the literature and the World Health Organization’s Guideline on Health Policy and System Support to Optimize Community Health Worker Programmes. Inform ongoing development of CHW programs, policy and strategy design, scaling, and sustainability in the priority countries. 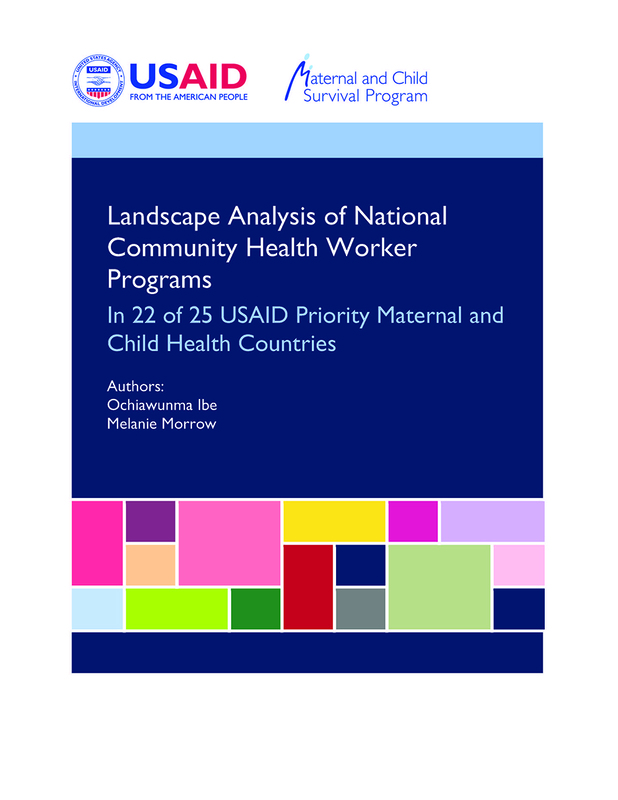 The report highlights promising country examples worthy of emulation and is intended for the consideration of country program planners, policymakers, implementers, and donors supporting large-scale CHW programs.